This is one of the reasons I love New Zealand. 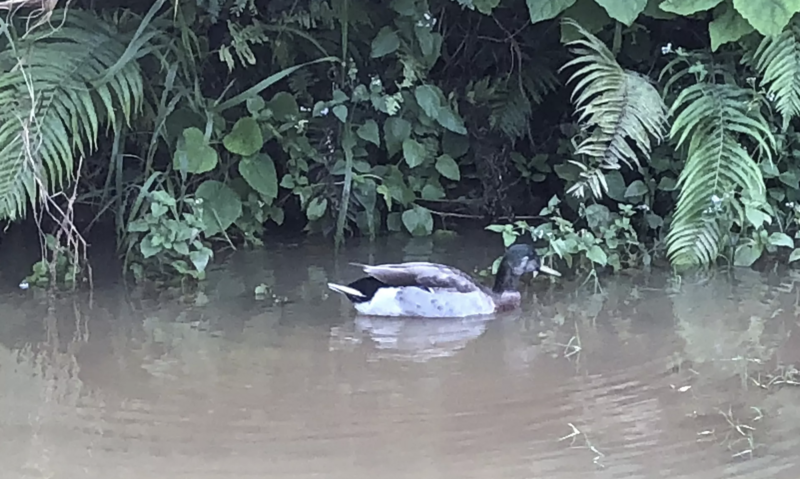 I’ve written before about the sad tale of Trevor, a lone and lonely mallard drake who had somehow landed himself on the small island of Niue, a self-governing state affiliated with New Zealand. He was alone, friendless, and didn’t even have a lake to swim in. The locals have pitched in to feed him, and the fire department on Niue even tops off a temporary puddle with extra water, but word has it that Trevor is being bullied by a rooster. I told Heather Hastie, my New Zealand friend, that her country should move Trevor to the North or South Island so he can swim and find love. I even said I’d pay for the move, and I would have. Heather was kind enough to write Jacinda Ardern, New Zealand’s Prime Minister, recounting Trevor’s sad tale. She got two emails back, one of which I posted before. In the first one, an advisor to Animal Imports said that moving Trevor to New Zealand proper violated the country’s biosecurity protocols, which of course are strict because of the destruction of local flora and fauna by introduced species. I’m sure you’ve heard about the mallard duck, named Trevor by the locals, who has somehow found himself stuck on Niue. It’s a really sad story. He’s on his own and there’s no standing water on Niue. Locals have been feeding him and keeping a puddle full for him. However, the water situation is going to get more difficult now that they’re getting to the dry season and there’s less water available. A friend of mine, biologist and animal lover Jerry Coyne (Professor Emeritus, University of Chicago), featured Trevor on his very popular website today. He has readers in almost every country around the globe, so it’s no longer just New Zealanders who are concerned about Trevor’s plight. On behalf of Rt Hon Winston Peters, Minister of Foreign Affairs, thank you for your email and concern regarding the Mallard duck in Niue. Our office is responding as the matters raised fall within the portfolio responsibility of the Minister of Foreign Affairs. Returning the duck to New Zealand may prove problematic as New Zealand has strict biosecurity laws and regulations that any Niuean individual or organisation wishing to export livestock to New Zealand is required to meet. Since arriving in early 2018 the Mallard has become somewhat of a national treasure in Niue. Niueans have taken a keen interest in the welfare of the duck. The Premier and Niue’s Department of Agriculture Forestry and Fisheries (DAFF) are considering options for securing the future welfare of the duck. A voluntary group of Auckland Veterinarians, due on-island in October to deliver services for island pets and wildlife, have been asked by DAFF to give the duck a health check. These arrangements should secure a safe future for the duck in Niue, allowing the local population, and interested tourists, to enjoy visiting Niue’s celebrity duck. This entry was written by whyevolutionistrue and posted on October 11, 2018 at 11:00 am and filed under ducks. Bookmark the permalink. Follow any comments here with the RSS feed for this post. Both comments and trackbacks are currently closed. Awesome! Sometimes humans can be decent people. Warms the cockles (duckles?) of one’s heart, it does. Or geoducks. Which, as I’m sure you know, are pronounced gooey ducks. Hey, ducks! Well, I can’t see why it’s not perfectly obvious. “Warming the gooeyducks of my heart” has a certain je ne sais pas, wouldn’t you say? As far as gooeyducks run, but who wants gooey ducks?? I prefer mine crispy. How about NZ taking a female NZ mallard to Trevor on Niue? Would the “self-governing state” object or have concerns? That would cause inbreeding; they’d have to have several hens. Still better than poor Trevor living alone! Glad they’re sending DAFF(y) to check on the duck. LOL! Let’s DAFF-y the duck! NZ volunteers of various types regularly go to Pacific Nations to supplement what expertise they don’t have locally due to their small size. In this case, a group of Auckland Veterinarians are going to Niue this month to check of the island’s pets and other wildlife and our Ministry of Foreign Affairs has asked them to check up on Trevor too. The vets will give Trevor a health check. Since Trevor finds himself all alone in an Edenic land, let’s all pray real hard that the Good Lord plucks from him a rib, and fashions him a mate. I see what you did there… but see Dr PCC(e)’s comment above; a problem few god-bothers have addressed (AFAIAA) with our Trevor and Eve story. A Democracy is judged by how it treats those who can’t help themselves, including ducks. This is why I love New Zealand so much. Good luck, Trevor. The whole world is watching. I’m sure NZ could rescue the duck then keep it in quarantine, like they do with dogs, until the duck could be transported to some other duck destination. True, I hadn’t thought of this!